Love entertaining family and friends? Then give your dining space a makeover. Discover dining room ideas for furnishings, décor and accessories and ensure it makes an impact. If yours is more grab-a-quick-snack than linger-over-lunch, get set for some dining room inspiration. Whether it’s a separate room or part of a kitchen or living space, decorating and furnishing a dining room with attention to detail will make the right impression on guests when they come over to share a meal, and needn’t put a strain on your credit cards. Deep red walls are traditional for dining rooms, so if you’re after a period house look without lots of expenditure, painting the walls of a dining room this shade can be a successful strategy. It probably works most effectively in a separate room, and particularly if it’s the venue for dinners rather than lunches. Why? Red walls look their best in candle and artificial light and because red absorbs light the walls will visually advance so the dining room feels intimate rather than airy – just the right vibe for an evening among friends. Looking for a more contemporary take on evening dining? 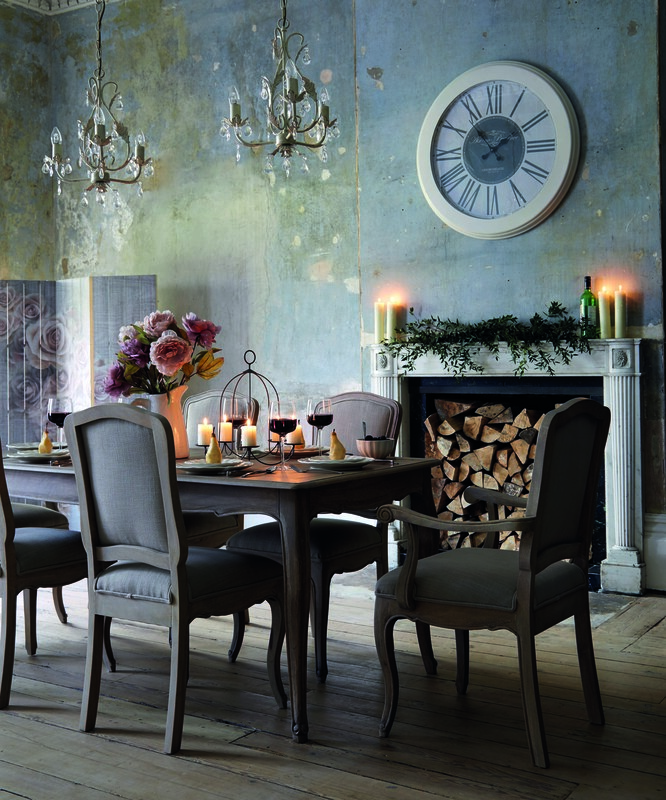 Charcoal tones are bang on trend and make for a dramatic backdrop to a dining space. As it’s just a matter of painting, this is an inexpensive way to makeover a room and it’ll create a cocooning feel. Our advice? Add in some metallic highlights with gold or bronze accessories for a luxurious finish that’s just right for special dinners. Dining area part of another room? It’s still possible to use a statement paint colour on the wall behind the table to visually separate the dining area. Alternatively, opt for wallpaper – it won’t tax your budget if it’s only on one wall. A design featuring metallics will add attractive highlights under evening lighting. Consider, too, fitting tracked door shutters in a statement colour. They’ll not only provide a sophisticated backdrop to a dining table, but they’ll also create a physical division as and when required in an open-plan living, dining and cooking space. Need to keep the walls pale to maximise light in a dining room or area? Look to introduce an attention-grabbing colour elsewhere. 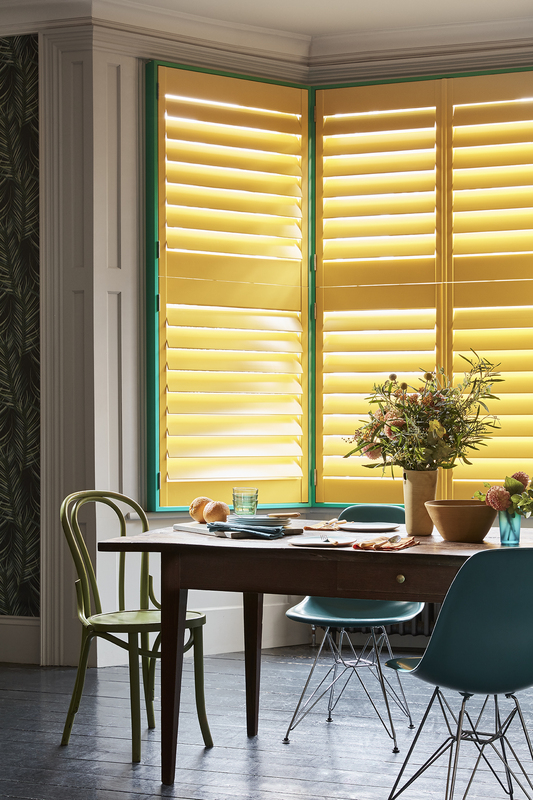 Shutters in a look-at-me shade are a great way to do it – and don’t forget that we can make shutters in any colour you want. Think an opulent golden tone, perhaps, or a warm, rich red to nod to dining room tradition. When it comes to picking new furniture for dining areas consider comfort and practicality. Upholstered seating will keep guests sitting pretty for longer but wipe-clean seats are better when you have a young family – or your guests do. More important than buying new furniture is giving everyone round the table adequate space. Allow each adult around 60cm of elbow room for comfort, and make sure there’s 90cm or so between the edge of the table and a wall or another piece of furniture so pulling the chairs out isn’t a struggle. Near the door, try to leave more space so friends and family can walk into the room and take their seats easily. Dining table shapes should suit the size of the room or area and the level of intimacy you want get-togethers to have. Round dining tables are a space-saving solution for small rooms and make it easy for everyone to join in a conversation. Large dining room? A round table can still look fantastic, but a big round table becomes hard to be heard across. A better solution here – and, of course, space-efficient in a rectangular room – is a rectangular table. The lighting for a dining space needs special attention as part of your home design. In a kitchen-diner, it’s useful to have the dining area’s lighting on a separate circuit from the cooking area (who wants to stare at the mounting used dishes as the meal goes on?) Dimmable lighting’s handy, too. The mood required for weekday meals is different from that for dinners with friends and the lighting level will help create it. Pendant lighting above the dining table will make a beautiful feature for the room. Chandeliers can add to the grandeur of the scheme, and there are classic or modern takes on offer on the high street and in DIY sheds, so they needn’t cost the earth. A series of pendants above the table looks good – think of three or even five depending on the size rather than an even number for a visually pleasing effect. Changing the accessories in a dining room can give it a brand new look on a tight budget and when time is short. Create a colour theme for table settings with charger plates in a metallic or coloured finish that can be teamed with white tableware. Water glasses needn’t be clear and can continue a colour theme, as can tealight and candleholders. Centrepieces are best saved for Christmas, but a grouping of vases makes a focal point without a vast outlay and can add a textural finish.